Heat oil in skillet or dutch oven over medium heat. Brown roast on all sides and remove to platter. While roast is browning, quarter 2 or 3 onions and remove outer skin, wash but do not peel about 6 carrots and cut into halves or thirds. 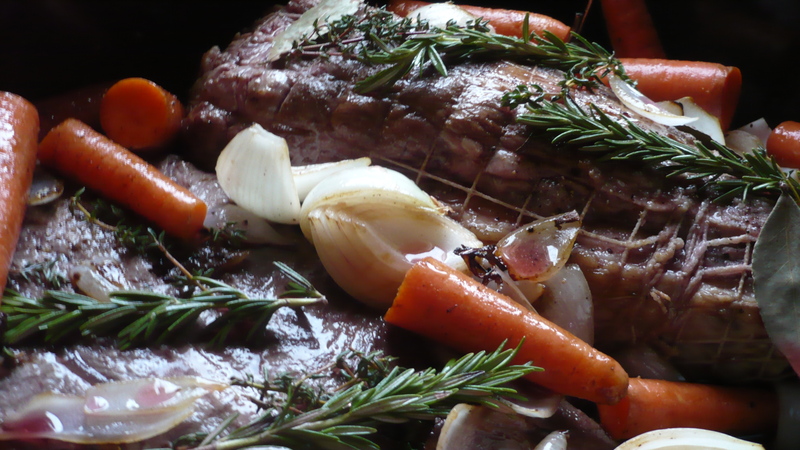 When roast is finished browning, remove from skillet and add onions and carrots to brown. You may need to add a little more oil at this point. Remove from pan and then add the water and stir and scrape any browned bits from the bottom of the dutch oven. Replace the roast and sprinkle with coarse salt and freshly ground black pepper. Cover with rosemary, thyme and bay leaves. Add the carrots and the onions and red wine. Cover and cook on stove top or in 350 degree oven for about 2 hours, checking every 30 minutes for doneness or until meat thermometer registers 160 degrees. Remove from pan, slice roast and serve with vegetables and mashed or roasted potatoes, salad and thick slices of crusty fresh bread! This entry was posted on February 19, 2010 at 7:48 PM and is filed under Ranch Life with tags recipe. You can follow any responses to this entry through the RSS 2.0 feed. You can leave a response, or trackback from your own site.